KLICKA HÄR FÖR ATT UPPDATERA! . .
EU borde stämma Microsoft för säkerhetshålet de skapade åt NSA, vilket ledde till den globala cyberattacken (maj 2017). Har USA betalat skadestånd till Läkare Utan Gränser för att de bombade deras sjukhus - eller får USA fritt begå krigsbrott utan gränser? liksom Tito gjorde i Jugoslavien. Låt inte kolonialmakter som Israel, USA, Frankrike o.s.v. och som de försöker uppnå genom sponsring av legosoldater utgörande den "fria syriska armén" ! som bland annat blodigt krossade ett folkligt uppror i Bahrain genom att skicka trupper dit. 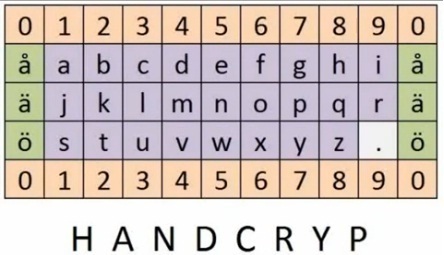 Search for: handcryp english, to learn a FREE way to encrypt and decrypt short messages without a computer and without doing any math computations, and in a way that is truly unbreakable and without possibilities for backdoors. 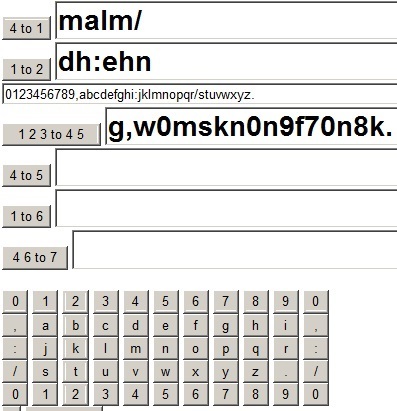 The trick is to do small-step "vector additions in cyclic schema space", character by character, using pre-delivered one-time "biologically generated" crypto keys that are not shorter than messages. It comes as surprise that decryption procedure is exactly the same as the encryption procedure. The schema can be public, but might vary in size. False keys can produce false messages of choice ! More people should invent their own encryption systems, to avoid "backdoors" - and to give snooping authorities overwhelming problems Encryption is a situation where it can be a good idea to construct your own nencryption computer program - and preferably a non-standard one. To be more safe, the encryption program should run on a computer that is never conneected to Internet, or you should "handcryp", without using a computer!